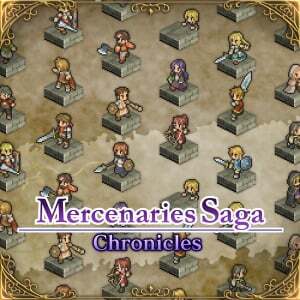 Mercenaries Saga Chronicles is a bundle of three previously released titles, all launching on Switch for the very first time. 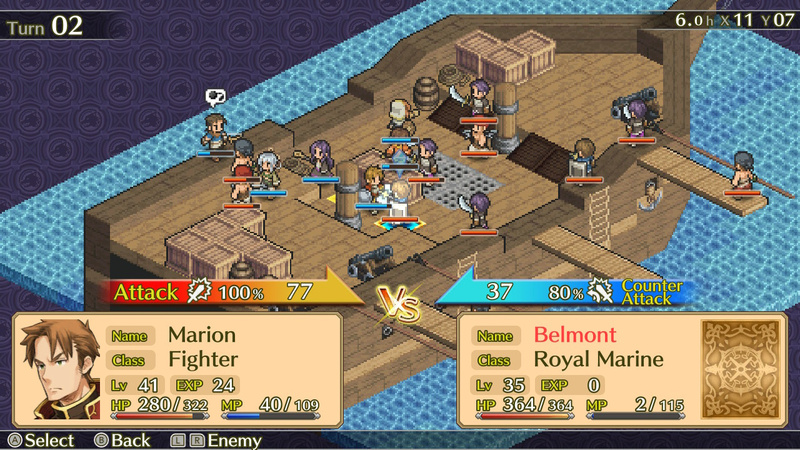 The first, Mercenaries Saga: Will Of The White Lions, was a mobile title originally, making this the first time it has ever appeared on a dedicated gaming platform. 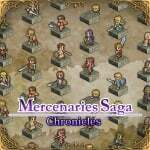 Rounding up the collection are Mercenaries Saga 2: Order Of The Silver Eagle, and Mercenaries Saga 3: Gray Wolves Of War, both of which originally launched on Nintendo 3DS. If you’re familiar with games such as the Final Fantasy Tactics series, or the recently released Ambition Of The Slimes on Switch, you’ll instantly feel at home here. 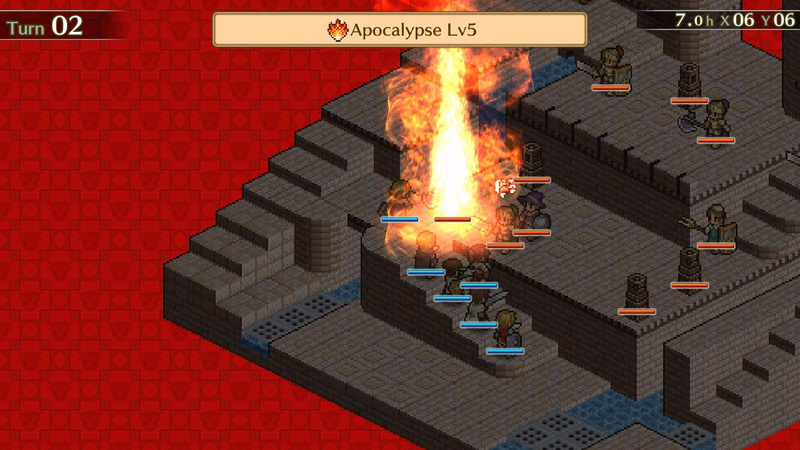 The Mercenaries games are tactical role-playing titles that feature battles taking place on isometric grids. As you win fights, defeat monsters and enemies, and open the treasure chests present on the field, you’ll earn gold and skill points which allow you to buy potentially life-saving items and level up your party of characters respectively. Acting very similarly to a game of chess, the game tasks you with placing and moving your characters around the grid, taking turns to either attack your opponents, raise a shield for added defence, or use a magic skill. Each character you unlock will be one of a variety of classes, such as ‘Fighter’, ‘Wizard’, or ‘Thief’, and each of these will rank up to new classes when you get them to specific levels. Even if you haven’t played a game of the genre before, you’ll likely pick things up after a few moments of tinkering around in battles; the battle menus are all relatively friendly and you are eased into the shenanigans relatively gently. That’s not to say that the games are easy, however; many battles had us waving a white flag of surrender for quite some time. One feature that strays from the norm slightly, and is therefore actually a very welcome idea, is that characters start battles with zero mana (points which are used to cast spells or magic abilities), gaining several points each as every turn ticks over. While you would usually enter a battle with a set amount, slowly carving away at it as you use up skills, this approach means that you can never go into a fight all-guns-blazing, and instead need to work out how to move around the battlefield safely. Similarly, when you move one of your characters around the field, you’ll be asked to specify which direction you want them to face. Your fighters will take more damage if they are attacked from behind or from the side, so this need for careful placement adds another element to the strategy of each battle. A mechanic called ‘aggro’ is also in place across all three games in the series, which theoretically tells you how likely one of your fighters will be targeted thanks to their previous actions but, in all honesty, this never really seemed to have much effect on our battles. Each game revolves around the idea of different kingdoms at war with one another, but despite having different places and characters in each title, each game feels like a carbon copy of the last. Each story is fine in its own right, and the quality of the games’ translations are great, but the plots are all so mundane and dull that you won’t be interested in them anyway. Sadly, after several chapters had passed, and especially as we began to explore the second and third games, we were desperately wanting to use the built-in ‘fast-forward’ option to skip every bit of dialogue. Unfortunately, this issue bleeds through into every single aspect of the trilogy. All three titles are identical in almost every way; the graphics and presentation, the gameplay itself, the menus, skills, and attacks have all been lifted directly from the first game and plastered onto the other two. Upon starting up your second, and then third, game, you’ll be wondering if you accidentally pressed on the first one again by mistake. This wouldn’t be too much of a problem if the games were engaging, but that isn’t really the case. With each story essentially sending us to sleep, and thanks to a rather bland overall feel to the presentation as a whole, we were heavily relying on the gameplay to keep us interested. Luckily, the gameplay itself is of a high enough standard that it manages to save the whole package; if you look past the monotonous dialogue you’ll find a more than competent tactical RPG lying underneath. Essentially, to make a decision on whether or not you should buy this collection, you’ll first need to know exactly what you are hoping to get from it. This isn’t a package that will excite you or have you completely hooked, and it doesn’t offer anything new that is worth the purchase alone, but what it does present you with is hours’ worth – and by hours we mean a lot of hours’ worth – of repetitive tactical battle gameplay done very well. If you’re happy to just play endless battles, levelling up your characters and using them to pass the time, this will be a decent way to do that – just don’t go into it expecting to fall in love. Mercenaries Saga Chronicles offers an awful lot of tactical turn-based strategy content for the asking price, but the dull storylines, repetitive gameplay, and absolutely identical nature of all three titles make us question the reasoning behind packaging them all together as a bundle. In their own right, each game will provide you with hours of well-designed battles, but we doubt many players will genuinely want to sit through all three games as they would be effectively playing the same game three times. I almost bought one of them for 3DS many times but always found something else instead. Let's see if the same thing happens with Switch. I like the presentation otherwise but the red background really hurts my eyes. I need a good or great story to go with my RPG personality, tho I love these types of grid based games. This series just doesn't seem to fully impress anyone, and for some reason I feel bad about it. Not related to this game but isn't Fe supposed to be released like today in America and tomorrow in Europe but still there are no reviews of the game anywhere ? Strange. After playing through the first game and on my way through the second one I will simply say that the game is solid. It´s generic, but it´s well made. The battles are hard enough if you want to play without grinding, but there is still manageable threshold of difficulty. You can see that it´s older game and there are some AI glitches that you can exploit, but there are also some nice surprises within the battles. Definitely worth the price because of the battles and the variety of characters. 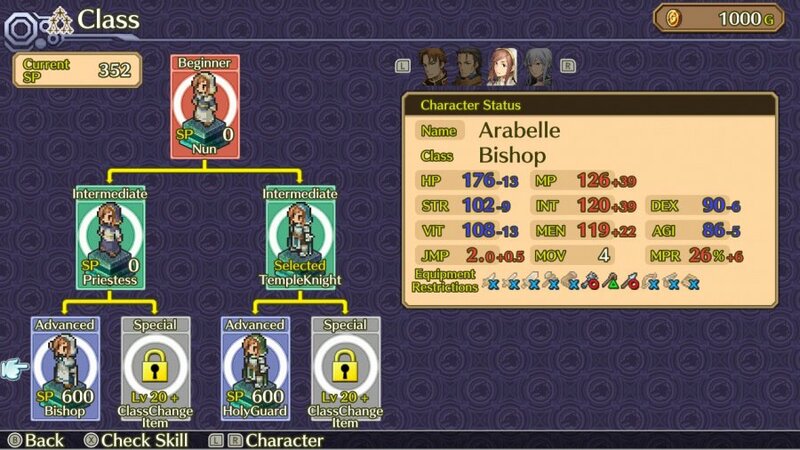 I like it, I think it's a much more solid budget SRPG compared to the stuff that Kemco keeps pumping out for example. Loved FFTA and similar games but just couldn't get into these on the 3ds. Don't see the point in paying for them again. "Unpolished" was my overwhelming impression from the 3DS release. Looks like that hasn't changed this time around, unfortunately. Impulse-bought it today and regretted it after five minutes. The gameplay is alright, but the implementation is very cheap. In cutscenes characters move very choppy and as it seems there's nothing else apart from Watching Cutscene -> Battle -> Repeat. I pre-purchased this but haven't put much time into it. I played the first level and it was fine. It's no Fire Emblem or some of the other stalwarts of the genre but for the cost it's a great value. It's probably something I'll beat the first one and a few months from now when I have a hankering I'll jump into the 2nd one. I agree with the review, I am playing the first one and have also started the 2nd game and they are very much the same . The cut scenes are very disposable but the actual gameplay (and surely this is what counts) is really very good and I really enjoy the battles and then upgrading . The value is outstanding for what you get and if you like tactical games like this I don’t think you can go too far wrong hear . If you want an engaging storyline however this probably won’t be your thing . Considering each title only cost you $5 each, the value of this collection is actually great but I don't see why it being a collection will make it lose some points. I mean I don't see any one complaining about playing the same old 8-Bit Mega Man games bundle together just cause they are part of a compilation. They are essentially just the same game eight times as well. Very good review, pretty much spot on. This is keeping me occupied while I wait, seemingly forever, for a price drop on Disgaea 5. It is such a shame that they couldn't come up with a better story. I’m actually really hooked on this right now and even though the storylines are linear the actual fighting parts are great fun ! The price reflects what u get. It could do more on the storyline but it still delivers solid tactical gameplay. It’s not as polished as something like final fantasy tactics but the gameplay is very similar to that so If you like that I think you will find something to enjoy in this . Huh. Sounds more like a 6/10. Oh Fire Emblem, where are you? @retro_player_22 I'm sorry my man but, Mega Man 1 to 3 to 5 are radically different. From gameplay mechanics, to enemy encounters, acquired weapons, graphics, music and level of accessibility due to difficulty. There's essentially zero copy and paste going on. Besides the Mega Man sprite itself. I would've used the multiple iterations of Street Fighter 2 as a better example. I bought this. 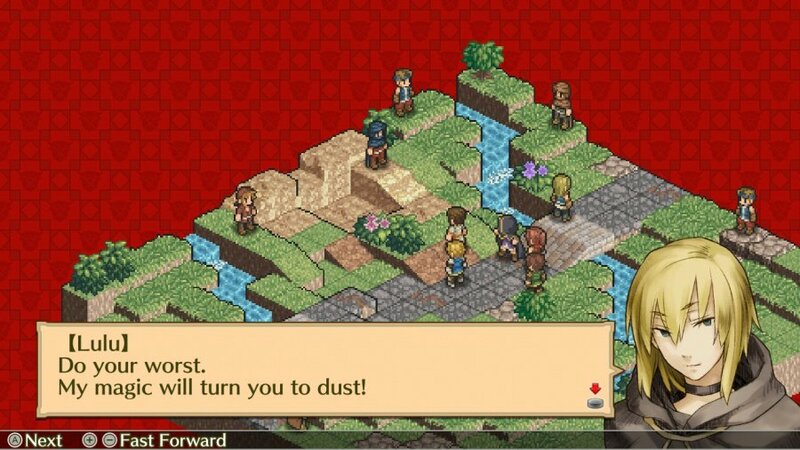 But it feels like Disgaea without the humor, fun story, creative visuals or memorable characters. I was let down. It just plays everything too safe. Leading to a bland and generic feeling experience. @Aven It is, minus all the flavor and memorability. I'm down. I usually play in short bursts anyway and taking a break between each part seems like a way to go. I wonder just how boring the story is. But it doesn't matter to me as much if the combat system is solid. Better than the other way around. Reviewer clearly never played Tactics Ogre-- as this is what the series was deliberately emulating from the graphics, to the story, to the music and mechanics. Each game takes place in a different part of the same world, and imo does have an entertaining story. I have 2&3 on the 3DS and this is the only reason I purchased a NS. Great games that also have decent post game content too. Deserve an 8/10 at least.